View More In Deep Fryer Parts & Accessories. accessory fits all standard air fryers.Baking pan is non-stick. Made of superior material, it is wear-resistant and durable. All accessories are dishwasher safe for each cleaning, easy and hassle-free clean up. 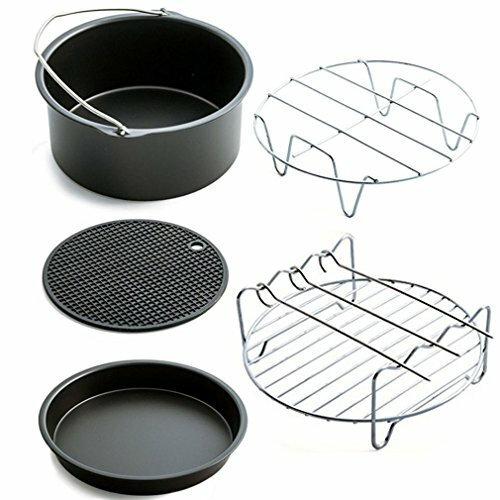 Air Fryer Accessories :1 x Cake Barrel,1 x Pizza Pan,1 x Metal Holder,1 x Multi-Purpose Rack with Skewers,1 x Silicone Mat .They are light and convenient to carry. It can be used at home for parties or family gather, even for a picnic, make different delicious food for your friends or family. Healthy and Quick cooking: Food basket of special lines formed at the bottom of the spiral heat flux, full 360 degrees of contact surface of food, fast away caused by heating of water vapor, which formed in the surface of golden crispy surface, the appearance of the fry and fresh taste! Universal Accessories :Universal accessory fits all standard air fryers.Made of superior material, it is wear-resistant and durable.Baking pan is non-stick. Bake your favorite cake in the cake barrel. Safety and Convenient: All accessories are dishwasher safe for each cleaning, easy and hassle-free clean up. 100% Satisfaction Guarantee: Customer satisfaction is our top priority, money back guarantee if you are not 100% satisfied return it and get refund within 30 days, no questions asked! If you have any questions about this product by Kath, contact us by completing and submitting the form below. If you are looking for a specif part number, please include it with your message.